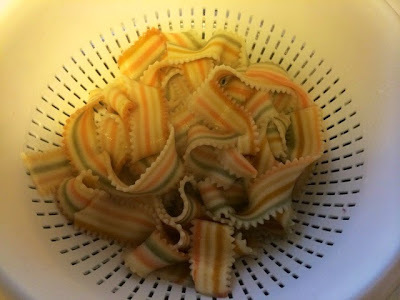 I’ve been indulging my pasta obsession again and have finally come up with a great recipe to use my rainbow striped pappardelle. These colourful pasta ribbons were the humble beginnings of what is now a fairly moderately sized colourful and unusual pasta collection. I don’t like to hoard them and let it all gather dust though, I’m a firm believer in using them up and coming up with all sorts of interesting tasty recipes to compliment how they look. 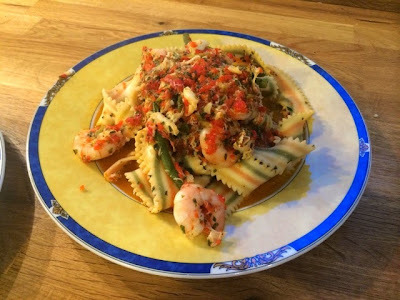 I’d originally planned to make a red pesto for these rainbow ribbons but changed my mind as I wanted something a little saucier to go with the seafood I was planning to use. I was packing in the seafood in another attempt to get The Boyfriend to try things he’d not had before. He’s a big fan of prawns but the crab was a new thing which went down very well. I find crab, like tuna, is such a good store cupboard ingredient. 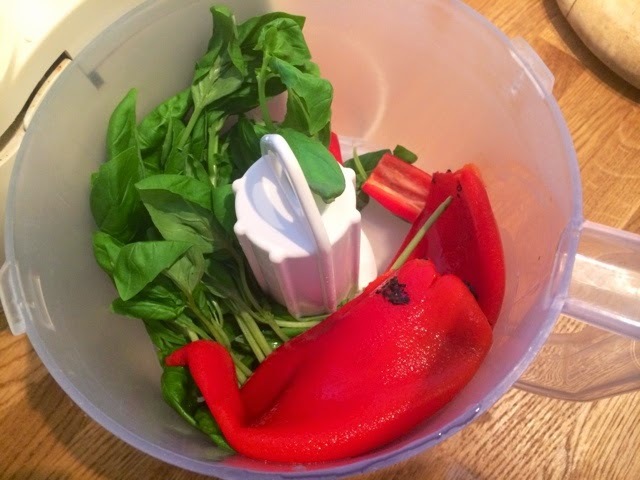 There are loads of different things you can use it for, it’s relatively inexpensive and will stay in your cupboard for ages without going bad. 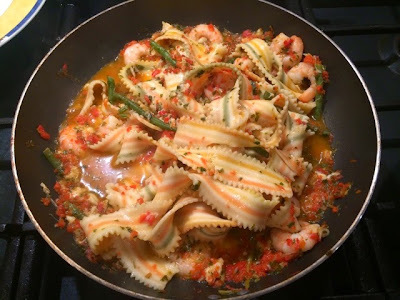 Obviously you don’t have to go out and find pretty multicoloured stripy pasta for this recipe, use any kind of pasta you have available. 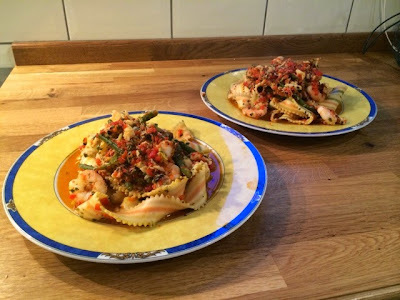 I think spaghetti, pappardelle, tagliatelle or any kind of pasta ribbons work well with this sauce. Or if you’ve got the time have a go at making your own. 1. In a food processor blitz up the peppers, chilli and basil. 2. 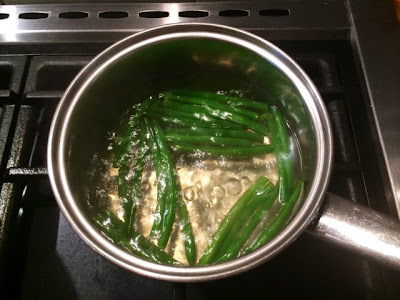 In a separate saucepan boil the green beans until soft but still with a little bit of a bite to them, you don’t ant your veg too soggy. 3. Put your pasta on to boil. 4. Heat a little oil in a large frying pan on a low heat and add the blitzed mixture from the food processor. Gently fry, heating through. 5. 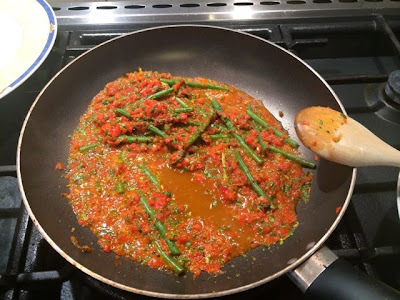 Add the cooked and drained green beans to the sauce. 6. Throw in the crab meat and mix through. 7. Add the prawns and allow to heat through. 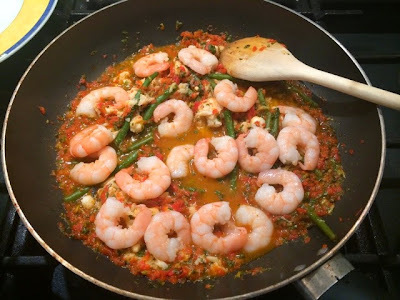 If using uncooked prawns throw them in before the crab and cook through. 8. Drain the pasta, reserving half a cup of pasta water. 9. 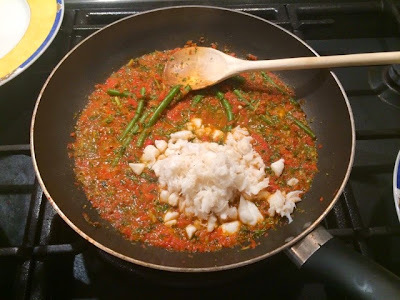 Add the pasta and reserved water to the frying pan and mix through, until completely coated in sauce. Add a generous squeeze of lemon juice before distributing between two warmed plates to serve.